Previous experience with client Saint presented greensplash with the opportunity to bring two thriving businesses under one branded group umbrella, bringing together two separate identities into one contemporary brand on an online platform. Following discussions with Saint it became apparent that the team required a fresh, clean website with the concept of ‘less is more’. 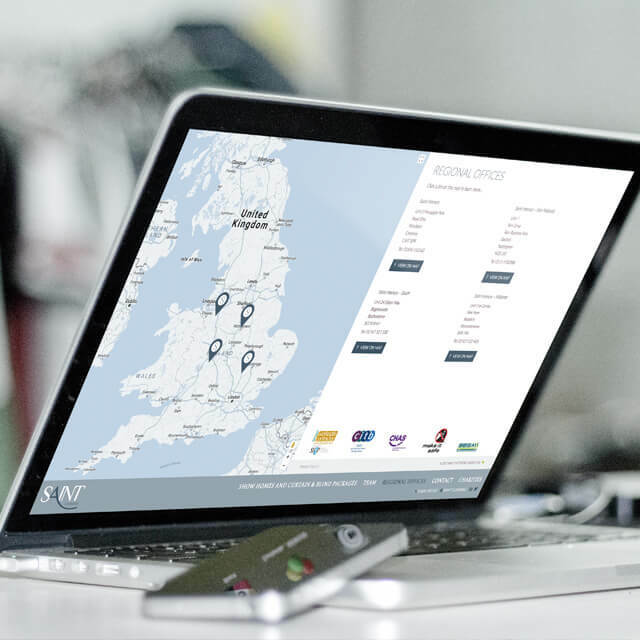 A brand that would convey their complete offering whilst differentiating the two branches of the business; an elegant website that appeals to a national target audience and showcases the Saint Group brand as a trusted market leader. An elegant, fully branded and easy to navigate website that appeals to the demographic audience of the country’s leading property developers which conveys professionalism, high quality and a superior service. Easy on the eye with superior imagery and clear, crisp copy, the Saint Group website now portrays a high-end offering to a specific target market. greensplash produced business stationary too. Existing client Saint, expressed a desire to bring its flooring and interior design businesses under one umbrella and to brand themselves as Saint Group. Previously, these two successful national brands had stood alone in the market place; but with a unified goal to consolidate their business operations, Saint desired a single brand that would encompass their values and offering. The Saint Group comprises of the brands, Saint Flooring and Saint Interiors. With an audience of both independent home owners and professional property developers, Saint provide superior solutions for superior properties. From complete show home design solutions to curtain and blind packages and a wide range of flooring options, Saint Group provides a bespoke service that meets the needs of its customers and their properties. 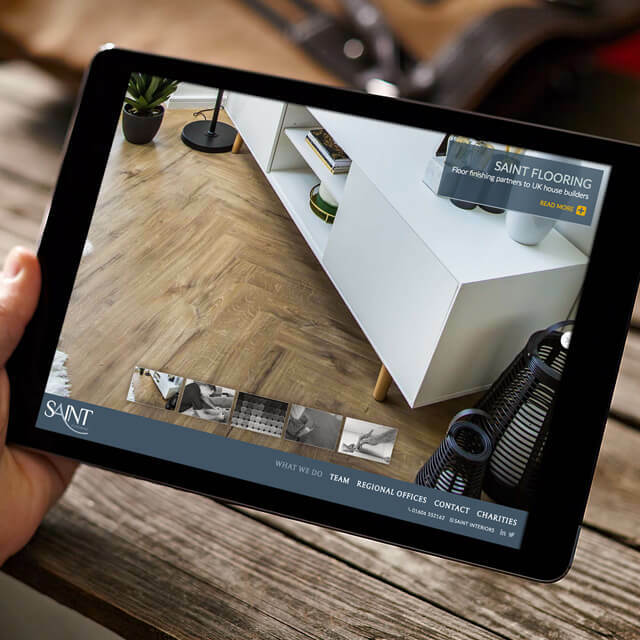 Providing expert guidance and committed to delivering a premium service, Saint Group are fast becoming an established name in both the flooring and interior design industry. The greensplash design department suggested a landing page showcasing the two sites with two subsequent websites following the same innovative and eye-catching branding style. The proposal was well received by the client and the design and build ensued. With a specific target audience of national property developers such as current clients, Morris and Seddon Homes, Saint needed the site to be tailored towards this very specific demographic. The site design was subsequently tailored to suit this market. 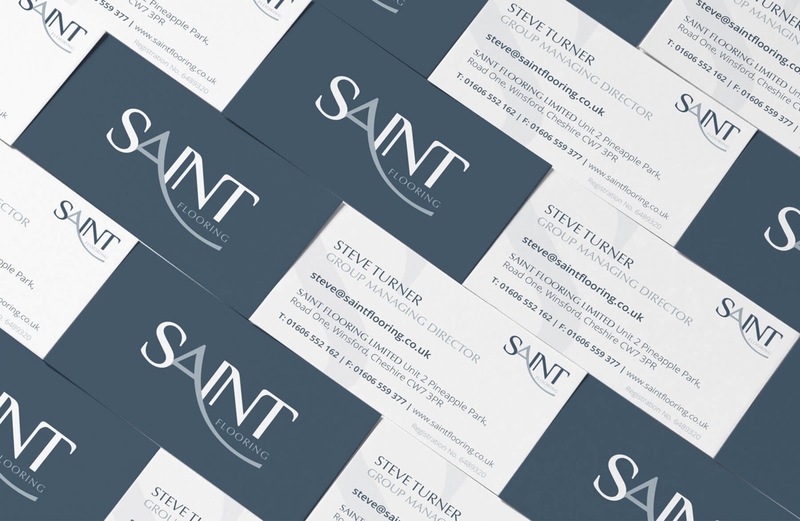 To discover Saint Group and to view the unified branding by greensplash for Saint Flooring and Saint Interiors, please visit: http://www.saint-group.co.uk.